This USB 2.0 hub has all the connectors you need for printer; iPod; iPhone and devices with USB Mini 5pin. 2 x USB2.0 female; 1 x Apple dock; 1 x USB2.0 Mini 5 pin Length: 12 inches . USB2.0/1.1 compatible. Win 98SE/ME/2K/XP/Vista; Mac V9.2.2 or higher. Plug & play. This USB 2.0 hub has all the connectors you need for printer; iPod; iPhone and devices with USB Micro connector. 2 x USB2.0 female; 1 x Apple dock; 1 x USB2.0 Micro; Length: 12 inches . USB2.0/1.1 compatible. Win 98SE/ME/2K/XP/Vista; Mac. V9.2.2 or higher. Plug & play. Transfer or backup your mp3s; digital photos; and digital videos to your desktop or laptop with rates up to 480Mbps. The Linkskey LKA-U2H04 is a mini USB 2.0 hub. It is designed to expand your PC or Laptop USB port to have more USB connections. The Linkskey LKA-U2H04 is a plug-n-play device. The LKA-U2H04 has a super mini design. It can easily fit into pocket and good for travelling and mobile computing. Carry around this slim USB 2.0 4-Port Hub with ease. 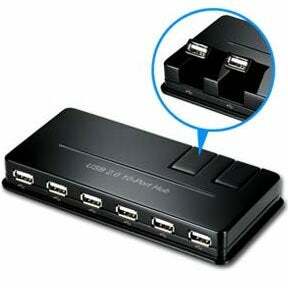 This 4-Port USB 2.0 Hub allows you to add more USB peripherals to your PC. Its USB 2.0 interface provides data transfers up to 480 Mbps and its small enough to take with you anywhere. Order today. Dimensions: 0.3 x 1.5 x 2.25-inches (H x W x D; approximate). The USB 2.0 Combo - 2.0 10/100Mbps Ethernet+ 2.0 Hub could not only add a network interface to your computer via USB but also to connect your computer to multiple devices such as digital cameras PC fans flash driver. This USB to Dual PS/2 adapter is perfect for connecting your PS/2 Mouse & Keyboard to USB Port on PC or notebook. A USB hub is a device that expands a single Universal Serial Bus (USB) port into several so that there are more ports available to connect devices to a host system. You can choose USB hubs aligning to your needs. We have 4 port USB 2.0 hub w/power supply, USB 3.0 4 port hub w/charger, individual port switch, USB 2.0 10 port hub, 4 port USB 2.0 squid hub, iPod/Mini5/A-Female x 2, 10 port USB 2.0 Hub with power adapter, 13-port USB 2.0 Hub with power adapter, 4 port USB 2.0 slim hub, and 7-port USB 2.0 hub and stand-alone USB charging station with AC Adapter.